Used with a wristband to create a path-to-ground for an operator with resistance <3.5 x 107 ohms per the required limits of ANSI/ESD S20.20, tested per ANSI/ESD S1.1 or ESD TR53. Superior electrical connection to eliminate intermittent failures of traditional snaps; extends the lifespan of the wrist strap. Maintains 1-5 pound release to prevent accidental disconnects and increased safety. Eliminates intermittent failures that occur with less durable cords and extends the lifespan of the wrist strap. Soft pull does not tug on the wearer’s arm. 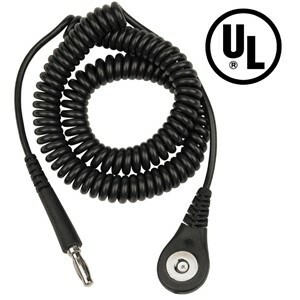 Prevents cord from being disconnected or getting in the way of operator’s work area.